Yu-Gi-Oh! 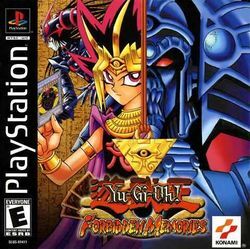 Forbidden Memories (known in Japan as Yu-Gi-Oh! Shin Duel Monsters or 遊戯王真デュエルモンスターズ封印されし記憶) is a 1999 video game based on the manga Yu-Gi-Oh!. It is essentially a digitised version of the Yu-Gi-Oh! Trading Card Game. This page was last edited on 14 April 2016, at 02:57. This page has been accessed 7,282 times.